Media interviews are sometimes arranged on very short notice, so here are ten suggested questions and answers that can serve as guides for what members of the media might like to discuss. 1) Explain the core argument of the book. A: There have now been two decades of exonerations of innocent defendants – almost three hundred in all. This has forced us to examine what has gone wrong. So now, we have decades of solid, rigorously done science on the basics of police investigation: eyewitness identification, interrogation of suspects, and forensic testing. The scientific research has shown us, first, that there are specific aspects of the ways we conduct these procedures that cause errors. For example, we now know that using traditional simultaneous lineups causes error because of the relative judgment process. But, second, the science has also shown us how to do these things in ways that lower the risk of mistakes. Staying with the area of eyewitness identification, the science tells us to use sequential lineups instead: showing the people in the lineup to the witness one at a time, and not together. The risk of erroneous identification drops. We see the same things in science on interrogation and on forensics: don’t do it like that, because it produces mistakes; instead, do it this way, and you will see fewer mistakes. What’s been the reaction? Has law enforcement adopted these new tactics and methods, in order to get the benefit of what science has to offer? No. Precisely the opposite: they have, generally, opposed and resisted these new scientifically proven methods. The question at the heart of this book is why. 2) Why has there been resistance? A: First, there are cognitive reasons: reasons related to the way human beings think. For example, cognitive dissonance stops people from considering these improvements, because they are sometimes seen as direct challenges to the “white hat” image that people in law enforcement have of themselves, and the science is therefore discounted or attacked. Second, there are professional and institutional reasons for this resistance. For example, prosecutors advance through accumulating convictions; for police, the parallel is arrests. There is fear that new methods might cause more difficulty in gaining convictions or making arrests, and therefore the professional progress of prosecutors or police officers may be impeded. Once we have an understanding of why there is the resistance, we can form strategies for how to break through it, and how to create change. The last part of the book focuses on those questions. 3) Give an example of something in the eyewitness identification area that comes from the scientific work. A: There is the example of simultaneous versus sequential lineups, discussed above: Simultaneous lineups focus the witness on which member of the lineup looks most like the perpetrator; this is called the relative judgment process. Showing the members of the lineup to the witness in sequence – on at a time – gets rid of the relative judgment problem. Instead the witness asks whether each individual person in the lineup is the right person. Another example: scientists have shown that having the lineup shown to the witness by a police officer who knows which person n the lineup is the “correct” suspect leads to an increase in errors. But when someone else – another officer, or even a civilian – who has no knowledge of the case — shows the lineup to the suspect, those mistakes disappear. 4) Give an example of science-based recommendations for suspect interrogations. A: The law allows police to use deception in interrogation, but the scientific work shows that when they do that, especially by lying about the existence of dispositive evidence (“we found your DNA at the crime scene”) or about harsh penalties for failing to cooperate (“talk, or you’ll get the death penalty”), suspects will confess to crimes, even very serious ones, they did not commit. The pressure they are under just becomes too great to bear. Thus prohibiting deception on this type of issue is vital to insuring that people only confess when they are guilty. 5) Give an example of science on forensics. 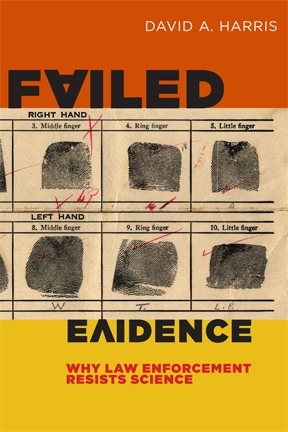 A: For years, fingerprint identification was considered the gold standard, and always defended as scientifically precise. Now, scientists have shown us that this is not true. Fingerprint identification is usually correct, but not always, and it is not infallible. It is also subject to human cognitive biases, because it is not data based, but instead based on human interpretation. Scientists have urged, at the very least, basic procedures for blind verification, yet few fingerprint identification operations have adopted this. 6) What can be done to break through this resistance, now that we understand its source? A: To break through the resistance, the leadership for change must come not from the left, but from the right, of the political spectrum. Leaders on the political left are too easily labeled soft on crime, and therefore they often hesitate to take bold action. Leaders on the right have much less fear of this kind of labeling, because they already have “tough on crime” credibility. It’s the “only Nixon could go to China” phenomenon. Another way to break through is to concentrate the main and most public efforts on fixing the system going forward, rather than focusing on the past. Past cases must, of course, be addressed, and they have been. But the effort must focus in how to prevent injustices in future cases. This is an effort everyone can get behind, because it is not about fixing the blame for past mistakes, but instead about seeing to the integrity of the system. No one disagrees with that. 7) Give an example of someone “leading from the right” on these issues. A: One of the most striking examples in the book is from North Carolina. Former Chief Justice I. Beverly Lake led the effort to create and institute reforms: an innocence commission to hear claims of innocence over which courts no longer have jurisdiction, and major reforms in eyewitness identification. Chief Justice Lake describes himself as “a Jesse Helms Republican, very conservative,” and very pro death penalty. Yet he has the same concerns others share: the integrity of the system. From his point of view, if the system is seen as lacking in integrity, prosecutors in North Carolina will not be able to get death verdicts. So he led the successful reform effort there. 8) If we are going to focus on the future, how can we address the injustices of past cases? A: The best mechanism for this would be to institutionalize Conviction Review Units, of the type pioneered in Dallas by Craig Watkins, the first African American elected district attorney in the history of the state. He created a small unit within his own office – just like a major crimes unit or a special victims unit – dedicated to review of convictions in cases in which there a plausible claims of innocence. As an institutionalized presence, which uses the Innocence Project of Texas as a partner to screen cases, the CRU allows the focus to be on reforms for the future. The CRU has resulted in some exonerations; it has also confirmed the guilt of the defendant in some other cases, and in others resulted in the apprehension of the real perpetrator. 9) Why did you write the book? A: It’s a chance to explore the issue of why people resist change, as well as why we don’t always do everything we can to assure justice for our fellow citizens. Both of those are questions that seem to me to lie at the heart of who we are as human beings, and as Americans. 10) Are you trying to create a perfect justice system? A: Perfection in the justice system isn’t my goal, and anyone who looks for perfection in the justice system will be disappointed. I’m hoping that we can be prodded to do the best that we, as people, can do to make the system fair. If we do that, we’ll make fewer mistakes. To do less is not worthy of what we call our justice system.